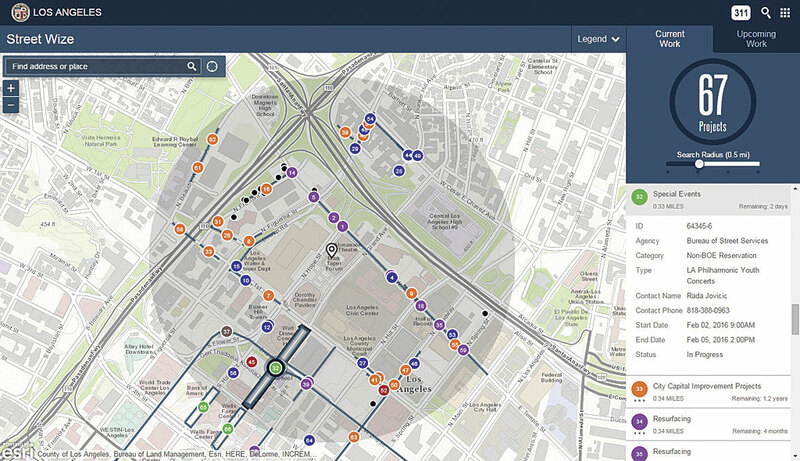 GeoHub, launched by the City of Los Angeles and Esri on January 29, 2016, gives Angelenos inside and outside city government not only visibility into how the city works but also tools to help make the city work better. GeoHub gives Los Angeles residents visibility into how the city works and the tools to make it work better. This portal at geohub.lacity.org provides anyone access to the city's geodata. In doing so, GeoHub realizes LA Mayor Eric Garcetti's desire to make government data a platform for innovation. It does this by going beyond supplying open data and providing open services and APIs for leveraging that data. Esri president Jack Dangermond was on hand for the launch, which was held at the La Kretz Innovation Campus, the city's cleantech industry hub. 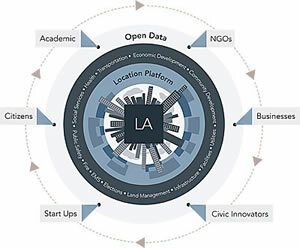 He noted that the vision that he and Garcetti shared was one in which open data grew into open services that in turn would facilitate not only better work inside the city but enable startups, nongovernmental organizations (NGOs), and citizens to incorporate geographic insights into their thinking and decision making. 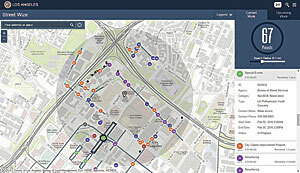 The creation of services enables web GIS mapping, and that is what has made this revolution in understanding possible. "Maps can actually be much more transparent than just data or even charts and graphs. You see it all and BANG, you get the idea," said Dangermond. Mashing up data from various sources in the city lets you see where the problems are and understand them by seeing geospatial data presented in maps. The city is making more than 500 layers of map-based data readily available. GeoHub flattens out a shared infrastructure of content. LA Mayor Eric Garcetti announced the launch of GeoHub. 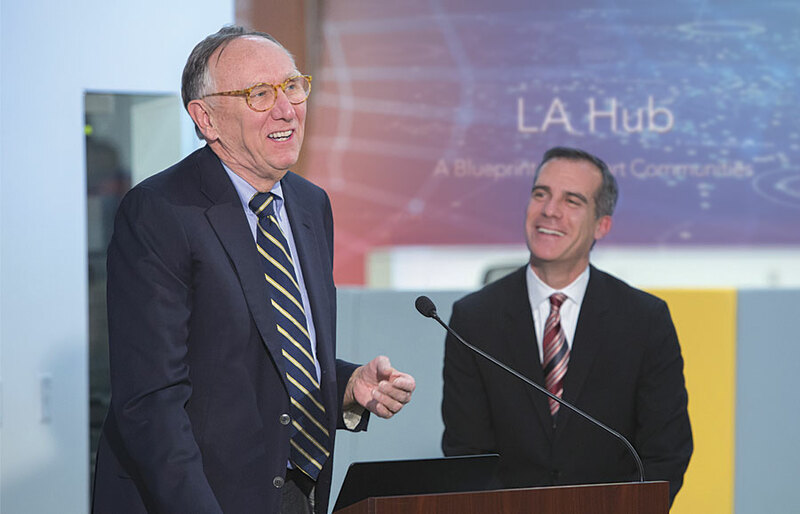 Esri president Jack Dangermond described the vision he and Garcetti share for bringing innovation to the city. 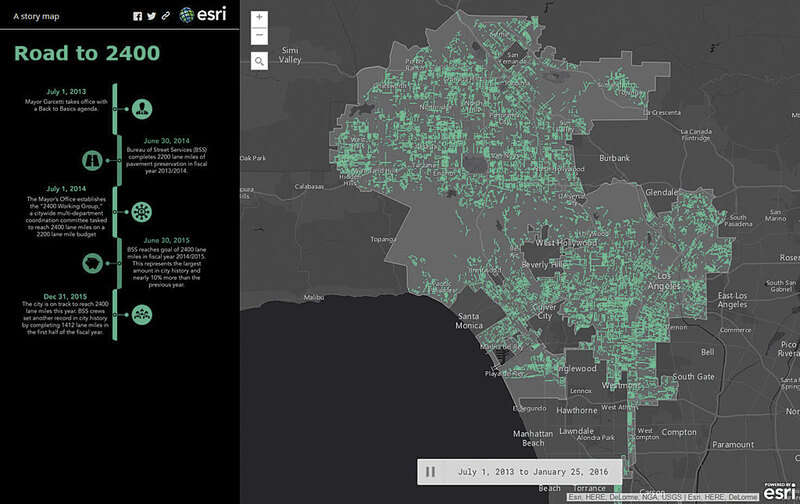 GeoHub makes more than 500 layers of Los Angeles' map-based data readily available. Garcetti underlined the value of GeoHub saying, "Almost anyone can benefit from the insights it puts at our fingertips." He used public safety response as an example of the value GeoHub brings to the city. If police officers, firefighters, or first responders have access to all the data all the time, instead of being limited to the information from the call, they can see the situation in a broader context. Having information about the presence of toxic substances, the location of sewer lines, and other information related to the location can make response more effective. The value of GeoHub extends beyond services to other areas of government. The city's finance department can use GeoHub to see areas where economic activity is thriving and areas that are not doing as well and determine how best to support both. The Street Wize app lets anyone track permit activity over time and space. The Road to 2400 app shows how many miles of street lanes have been paved since Garcetti took office in 2013. Maps can present more complicated data in a way that is more useful than spreadsheets. For example, the Street Wize app lets anyone—city staff, business, or citizen—track permit activity over time and space so that projects can be planned to avoid delays. Some maps show how the city is reaching its goals. The Road to 2400 app displays the streets that have been paved since Garcetti took office in 2013 when he vowed to pave 2,400 lane miles of streets. GeoHub is groundbreaking, not just for Los Angeles but also for the world. It is the first time that data and maps have been put together in this way, and other cities, such as Paris, have expressed interest in this work. This approach to open data will change the way people, technology, and cities interact. "Suddenly we have geographic information coming together for everyone in an open and accessible portal," said Dangermond.